Baby Costs > How Much Does Baby Formula Cost? How Much Does Baby Formula Cost? Although most experts still say that breastfeeding is best, they also say that formula is a perfectly acceptable substitute. Many moms are unable to breastfeed for many different reasons, so formula may be the only option. When planning to have a baby, the cost of feeding the child should be taken into consideration. Store brand formula (which most doctors say is just as good as the name brand) usually costs about $12 for the larger can. This will last about a week, depending on how many ounces your baby drinks per day. The average baby will need about 4 cans per months, which equals about $50. On average, it’s best to budget at least $3 to $5 per day. This will all depend on the amount of baby formula your baby has to drink. The older they get, the more formula they will require. The pre-mixed formula that doesn’t need to be warmed up will cost an average of $4 to $6 per day. A concentrate that comes in a can that needs to be mixed with water can cost $3 to $5 per day. Powder in the cans can cost $3 to $4 per day. Name brand formula, such as Enfamil or Similac, is usually about $23 for the larger can. This will last about the same amount of time as the store brand, resulting in a monthly cost of about $100. According to the Breastfeeding Center of Ann Arbor, you should be prepared to spend about $0.11 per ounce. If your child has digestive problems, is lactose intolerant, or needs soy-based formula for any reason, the monthly cost of formula will increase to about $65 a month for store brand or $125 a month for name brands. Depending on where you live, you may need to buy distilled water to mix in the formula. A gallon of distilled water is usually around $1 per gallon. Baby bottles are required to hold the formula and water. Depending on the brand of bottle, a bottle can start at $2. Those who want to keep the bottles warm or sterilize them will find that a sterilizer can cost $20 to $55. The ounces listed on the container will greatly influence the price. Common container sizes will include, 12, 25, and 33 ounces. Store brands are commonly going to be cheaper than the name brands. Since baby formula has to be both FDA and ADA approved, you can be assured that the formula will be very safe for your baby. Local grocery stores and wholesale clubs such as Costco commonly carry their own brand that can cost 20% less. Organic brands are going to cost more than the generic brands. Organic brands will only use organic ingredients with their powder blends. Powdered form is always going to be the cheapest. If you’re on a budget, consider this type over the liquid. When mixing powder based baby formula, always make sure that you use sterilized water. Ready-to-feed formula will come mixed with everything include the water. This type of formula is the most expensive but can be used straight from the bottle, making the preparation process very easy. Before formula is poured into a bottle, always make sure that the bottle has been washed out with hot water and soap. Always do this even if the bottle is brand new. Recalls with formula can happen all the time. 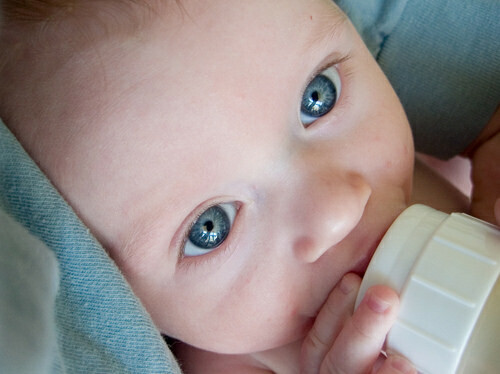 Always make sure that you keep a close eye on them to make sure that your baby is drinking a safe formula. Once the formula is mixed it is only usable for up to an hour. Therefore, if you are careful about how much you make you will have less waste, resulting in saving money. All brands of formula are on sale from time to time, and coupons are also available for many different brands. Some companies even have rewards programs, such as Enfamil Family Beginnings. Check with local grocery stores and wholesale clubs to see inquire about their store brands. These no-name store brands will be FDA approved, but the baby formula cost is at a lower price compared to the name brands. Of course, breastfeeding can be a great option. Not only will this help you save a lot of money, it’s very nutritious for your baby. If you’re having a hard time breastfeeding your baby, consider talking with a local center. Local government offers programs such as WIC. Those who meet certain income requirements will find that the government will cover all baby formula costs. Unfortunately comparing prices also means comparing different formulas. This can cause a lot of waste if your baby does not like the formula you chose to buy. Most companies will send free samples by request. This allows you to be sure your baby will drink and digest the formula properly before you purchase a whole can of it. However, it is not good for the baby to switch formulas very often, so try to find something that works and stick with it. Just about all baby formula brands will have a newsletter or club that you can join. These signup forms can be found right on their main website. When you sign up, they will send coupons, freebies and more. Some examples include the Similac Welcome Addition, Nestle Good Start Program, and Enfamil Family Beginnings. The local Sunday paper can have coupons, too. Search for these coupons using online coupon databases or browsing through the SmartSource and RedPlum publications. Costco has a rather large bottle of formula for less than $20 – best value out there. Also, if you compare ingredients to Similac, they are almost identical.